When I was 16, I worked for the Lake Wildwood Golf Pro Shop driving the cart that picks up golf balls. On an hourly basis I’d get in the caged golf cart and drive back and forth on the driving range, and as I’d get closer and closer to the practice tees I could see everyone’s eyes light up; I was a moving target. Sometimes I’d be listening to Pearl Jam on my Walkman (we had these things called cassette tapes back then) and a loud bang would rattle the top of the cage … bulls-eye! Sometimes real estate can be a moving target too, especially in a complex area like Lake Wildwood. Never fear, I will be your caged golf cart target, providing you with an in-depth look at the different markets within Lake Wildwood. 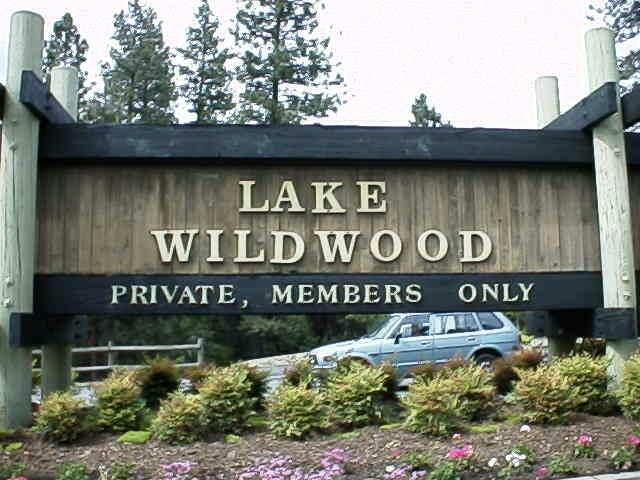 Lake Wildwood is a gated community in the scenic Sierra Nevada Foothills of Northern California. Nearly 3,000 private homes are located in a lush wooded setting on a large and beautiful lake. Lake Wildwood is a private gated PUD community that can only be accessed by its members and their guests. The PUD development features approximately 3,000 homes, an 18 hole golf course & driving range, a golf pro shop with adjacent sports bar, a Jr. Olympic swimming pool and wading pool, 6 tennis courts, clubhouse with bar and dining facilities, RV storage, lake, and numerous ponds, 6 developed parks, 84 slip marina, and 24-hour public safety. On a personal note, my family moved to Lake Wildwood when I was 4 years old. I attend Pleasant Valley School from kindergarten through 8th grade. When I was in high school, I worked in the golf pro job, as mentioned, for the public works department during the summer weed-whacking vacant lots and greenbelts, and also as a lifeguard and swim coach at the community pool. Go Water Otters! Data from 2010 shows how the real estate market in Lake Wildwood has changed over the years. 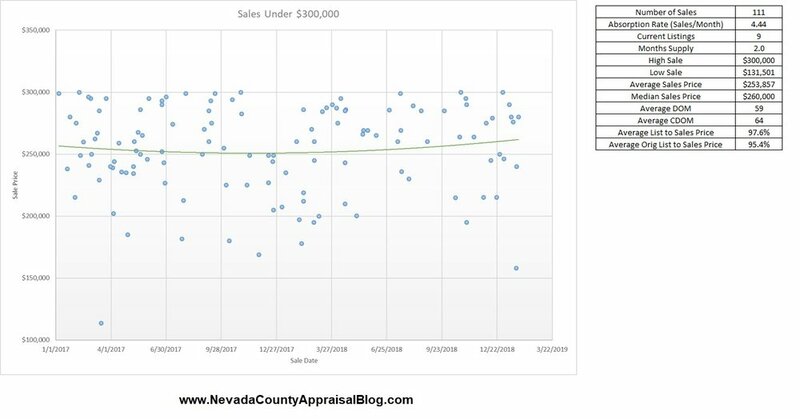 As is the trend throughout the county, prices and sales bottomed out in 2011-2012 but have continued to recover through 2018. The last column shows data from the prior 6 months. It's interesting to see the Absorption Rate (a fancy way of saying sales per month) and median prices have slightly decreased when compared to all of 2018. The Absorption Rate decreased by 24%, and median prices reduced somewhat by 2%. Based on the prior 6 months of sales there is a current supply of 4.05 months (52 Listings). In 2018 the high sale in Lake Wildwood was $2.25 Million, and the low sale was $178,000. This goes to show there are a variety of submarkets within the gates of Lake Wildwood. I’ve chosen a few price ranges to analyze to show changes since 2010. In 2010 70% of the sales in Lake Wildwood were under $300,000. In 2018 that number shrank to only 26%. The graph shows all sales since 1/1/2017 and indicates a very stable market. This is entry-level homes within Lake Wildwood which has historically been a solid market and remains in a shortage. The $300,000 - $450,000 is currently the largest market within Lake Wildwood. In 2018 50% of the sales were in this price range. In the prior 6 months average and median prices have slightly declined compared to 2018 and average DOM and CDOM have slightly risen. With 26 homes currently listed this price range is overall in balance. In 2011 only 3% of sales were within the $450,000-$600,000 price range. While this grew to 18% in 2018, this price range is well above the 2018 median price of $353,500 for Lake Wildwood. These types of homes are the higher quality, larger square footage homes that may be located on the golf course. There are currently 11 homes on the market within this price range and is still considered balanced. Homes that sell above $600,000 within Lake Wildwood are typically the waterfront and/or specialty homes. There isn’t much market activity between the $600,000 - $800,000 range, but pick up when you get into $800,000 and above range. Many of these homes are waterfront. As expected, activity in this market is much slower with historically higher marketing times. Golf Course homes have different levels of quality and prices have ranged from $238,000 - $739,500 since 1/1/2017. The median price of golf course homes is significantly higher than the overall median price for Lake Wildwood (23.7% higher), but this could be due to higher quality construction and larger living area. Marketing times similar to all of Lake Wildwood and there are very few homes currently listed for sale. The lakefront market is easily the most complex market within Lake Wildwood. Since 1/1/2017 Most lakefront homes have been between $500,000 and $1.5 Million but there have been a few homes sold over $1.5 Million 2015-2018. There are probably 3-4 submarkets of lakefront homes in Lake Wildwood, and all are incredibly complex to track. Currently, there are 5 listings of lakefront homes ranging from $935,000 - $1.95 Million. Lake Wildwood is a complex market with a variety of price ranges. As expected the lower price range below $450,000 is a stable market that is typically undersupplied. As price ranges increase, markets become less stable, and inventory rises. There are some specialty markets such as golf course homes and lakefront homes which can sell substantially higher. This analysis was completed at the request of one of my loyal readers, Robin Hamilton of RE/MAX Performance. Please let me know if you have any comments or topic request. I love feedback in the comments below or by email at brian@snappraisal.com.